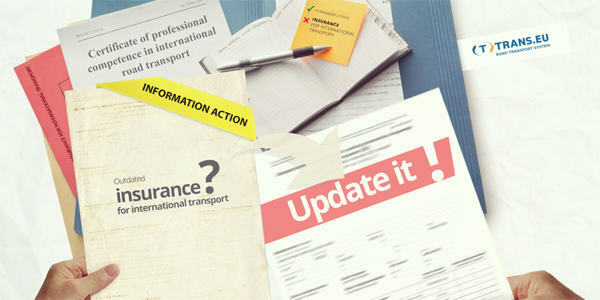 Trans › Blog › Logistics 4.0 › Information action – care for your documents! Information action – care for your documents! Did you remember to add licenses to your profile that authorise you to transport loads in your country and abroad? Are your couterparties aware that you are authorised to provide freight forwarding services? Did you update the invalid documents or is there an insurance from two years ago in your profile? ⇒ make your potential counterparty sure that business with your company is safe, as you are insured for national/international transport and, in the case of freight forwarding, freight forwarded insurance. **License for road transport concerning providing intermediary services in the transport of goods. 1. Choose the document type. 2. For insurance add issuance data and validity date. 3. Add a page (full documents or page by page). IN THE EVENT of the scanned files being “too large” or in an invalid format, use the page which can help you modify the document to appropriate parameters: konwerter.net. 1. Choose the file from your computer. 2. Define the desired format (preferably JPG). 3. Set the picture quality factor to 100 and CONVERT. 4. When the file is modified, download it and add in the System. Take care for your company image in the Trans.eu System. Make the current and future couterparties aware that by cooperating with you they work with a reliable and safe company!